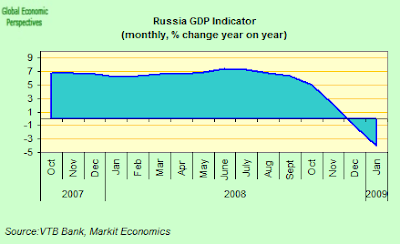 It also gives us some indication of the viability of VTB’s Russian GDP Indicator (as posted here) which indicated a year on year rate of contraction of 4 percent in January, down from December’s 1.1 percent decline, and November's 2.1 percent expansion. This is somewhat under the actual reading, but it is an estimate in real time (we got this at the start of February) and it was by far the nearest estimate I have seen. The underlying dynamics of the current ruble devaluation are provoking more than a little consternation in Russia at the moment. 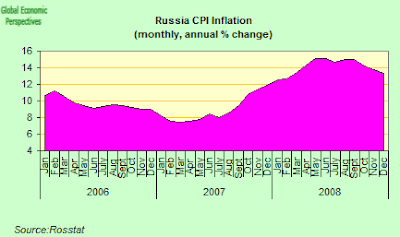 In the forefront of the debate are data from Bank Rossii (the central bank) which show they lent 7.7 trillion rubles ($214 billion) in overnight and seven-day loans (secured with bonds or other collateral) in just 16 trading days last month - this was about double the 4.8 trillion rubles provided via so-called repurchase auctions in December. 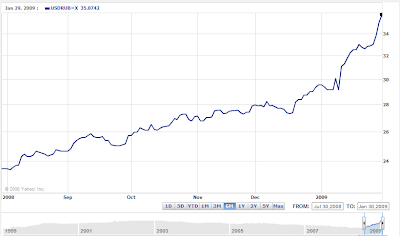 Over the same period the ruble lost 18 percent against the dollar. The question is, is there a connection here? Russia's banking authorities now certainly seem to think there is and Kommersant reported (Friday) that policy makers planned to reduce bank loans in an attempt to limit bets on the ongoing ruble devaluation. As a result the ruble remained safely within the target band all day Friday, and there was no need for any kind of intervention. The decision follows several days of severe criticism over the way in which Russian banks appeared to be using the loans being made available to them. Oleg Vyugin, former deputy central banker and currently chairman of MDM Bank has suggested that Russia's banks have now accumulated about $40bn in hard currency deposited for their clients on accounts with the central bank and another $40bn on accounts held with foreign banks. According to Bloomberg, Russia's banks bid for 505 billion rubles in repo auctions on Thursday, more than the 402 billion rubles actually lent. Banks also requested 139 billion rubles in an auction of unsecured loans on 3 February, about six times the 23.5 billion rubles provided. The possibility of obtaining such loans was opened up to over 100 Russian banks in November as part of a plan to boost liquidity amid the seizure in global credit markets. The extra funding has helped lower the average interest rate banks charge each other for overnight loans, known as the MosPrime rate, to 10.83 percent on Wednesday from a record 25.17 percent on Jan. 27. Bank Rossii may send representatives to individual banks to check on their foreign-currency holdings, said Stanislav Ponomarenko, chief economist in Moscow at ING Groep NV. President Dmitry Medvedev told the Federal Security Service, Russia’s spy agency, to monitor the allocation of state funds on Jan. 29, saying it is “doubly criminal” for investors to get rich off the crisis. 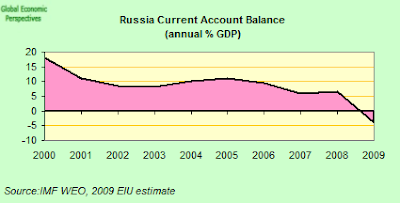 In any event, while a lot of people in the Russian establishment seem busy trying to decide which side they are batting for in all this, a Russian economy which is basically being starved of liquidity is now spirally downwards and downwards. 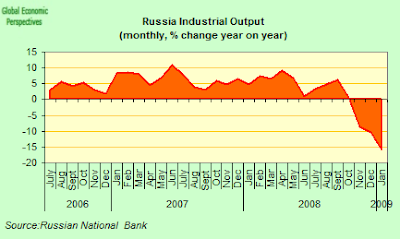 The most recent piece of evidence for this comes from the latest reading on VTB’s Russian GDP Indicator which showed that economic output contracted at a year on year rate of 4 percent in January, down from December’s 1.1 percent decline, and November's 2.1 percent expansion. 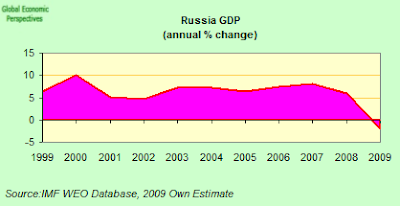 According to Russian economy Ministry estimates the economy will contract by only 0.2 percent this year after expanding 5.6 percent in 2008, so this estimate now seems hopelessly out of date. If we look at the monthly contraction rate as a reflection of the current quarter on quarter contraction, we find a rate of minus 1.6%, which means that the present rate is something like a 6.5% annualised shrinkage rate. At present this is stationary and not accelerating, but it is quite strong, especially for an economy which only six months ago was expanding at a 6.5% annualised rate. 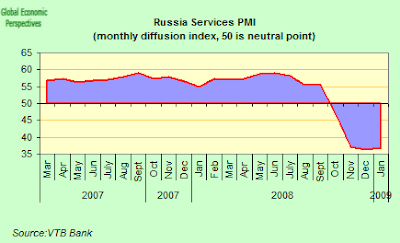 Russia's services industries are still not contracting as fast as the manufacturing sector (34.4), but with the Russian economy shedding 800,000 jobs in December the outlook for improvement is not exactly bright. The PMI reading was little changed - and close to December's all-time low rising to 36.8 in January from 36.4 the previous month. Since a reading over 50 indicates expansion, and below 50 a contraction, this is still a pretty hefty rate of shrinkage. Meantime retail sales grew at the slowest annual pace in nine years in December while disposable incomes fell 11.6 percent. “Business activity and incoming new business contracted further to record lows due to still weak demand,” said Svetlana Aslanova, senior corporate analyst at VTB Capital, in the report. “Low levels of workloads have forced companies to cut costs” resulting in jobs cuts, she added. New Policies From The Administration? With declining reserves in the background, and oil prices which may well not rebound very much this year to concentrate their minds, the Russia adminstration indicated on Wednesday that it was about to make a significant change in the policies it is deploying to fight the financial crisis. The move basically involves switching from bailing out individual companies to attempting to directly support the economy through the banking sector. At the same time Moscow is planning large budget cuts in an attempt to limit the fiscal deficit since letting it run too high threatens to eat up Reserve Fund resources far too quickly if oil prices remain low for any length of time. 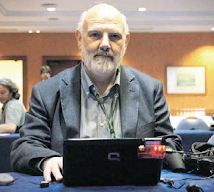 The general impression is that the administration has now lost hope it can avoid the crisis simply by increasing public spending and is instead digging in deep in an attempt to endure what might turn out to be a rather prolonged recession. 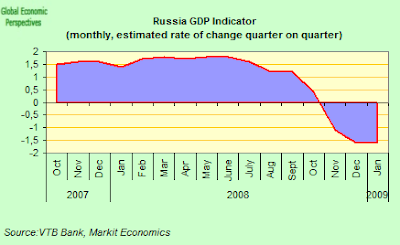 The policy change was announced by Igor Shuvalov, Russia's first deputy prime minister, who stressed the government was deliberately choosing to allow gross domestic product growth to fall to zero or below in 2009 to stabilise the economy and maintain foreign exchange reserves. He was thus explicitly rejecting the advice of those economists who had suggested using the reserves to finance a budget deficit of 10 per cent of GDP to promote growth. Of course the risk here is that this will produce a much stronger GDP contraction with unknown social consequences. Shuvalov also indicated the government would invest “several percentage points of GDP” in strengthening the banking sector, covering “possible future losses” and supervising a consolidation plan that would see the number of banks cut from 1,100 to 500. Alexei Kudrin, the finance minister, confirmed during a visit to London that the state was preparing to inject $40bn (€31bn, £28bn) capital into banks provided that the money was channelled into the real economy. This would follow last year’s Rbs960bn package of subordinated loans. Shuvalov indicated some key industrial companies would continue to get priority, headed by military enterprises, Gazprom, the gas monopoly, electricity groups and the state railways. This is a far more tightly focused target than the previously announced list of 295 industrial companies deemed worthy of financial support that included oligarch-led groups such as Rusal, the aluminium company, and Norilsk Nickel, the metal combine. Shuvalov suggested that the state should not have lent $4.5bn to Rusal, Oleg Deripaska’s aluminium group, on the security of its 25 per cent stake in Norilsk Nickel, the metals company, when it was clear these shares were worth only $1.5bn. In line with the change in policy Vladimir Putin gave the go ahead on Thursday for a second wave of bank bail-outs to extend up to Rbs1,000bn ($28b) in order to refinance the banking sector with new capital and subordinated debt in an effort to transfer the burden for bailing out companies on to commercial banks. Of the three big state-controlled banks, VTB is to receive Rbs200bn in new capital, state-owned VEB is to receive Rbs100bn in capital and Rbs100bn in subordinated debt, and Sberbank, the huge savings bank, may receive funding in the region of Rbs500bn. The moves will increase the state’s stakes in these three banks, boosting its role in the Russian economy. The state’s stake in the three banks are Sberbank 61 per cent, VTB 77.5 per cent and 100 per cent VEB. Vladimir Putin said Moscow could also inject up to 100bn roubles in subordinated loans – Tier 2 capital under international banking rules – into private banks but said the government would not seek stakes in return. companies, which must repay some $140bn in foreign debts this year. accounts for more than 70 percent of Russia’s exports. Russian manufacturing contracted at its second-fastest pace since 1998 in January as companies continued cutting production and jobs amid collapsing demand at home and abroad, according to the latest manufacturing PMI report from Markit Economics and VTB Capital. 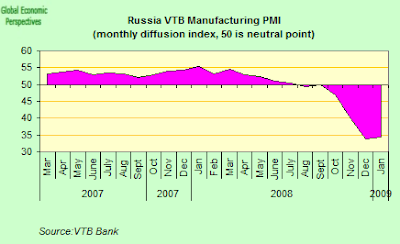 VTB’s Purchasing Managers’ Index rose to 34.4 from December’s record low of 33.8. The length of the manufacturing contraction is now just one month short of the slump that occurred during the 1998 economic collapse. Basically we still need to see the services PMI (out later this week), but this looks to me (on a rough calculation basis) like a 1% quarter on quarter GDP contraction rate, or an annual rate of GDP contraction of 4% in January. “There were numerous reports from panelists that the weaker ruble had partially offset the impact of falling global commodity prices, resulting in a slower overall rate of deflation,” the report said. Meanhwhile the ruble weakened again this morning, and fell below the central bank’s target exchange rate of 36 per dollar, only two weeks after Chairman Sergey Ignatiev widened the trading band and committed to using reserves to defend the new level. The ruble depreciated as much as 1.7 percent to 36.3550 per dollar in trading this morning, its weakest level since January 1998.